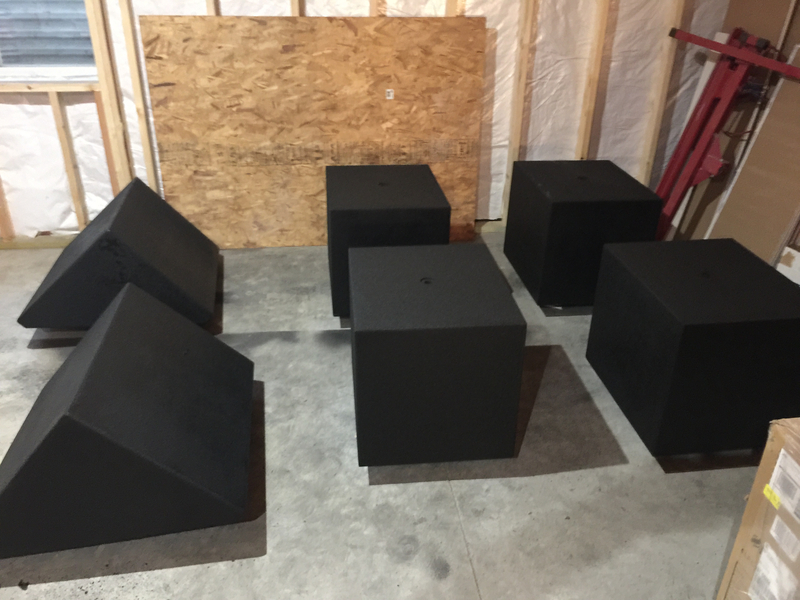 So I have been working on getting my basement finished and decided to take a break from the standard construction work to start building the rear subs for my theater. 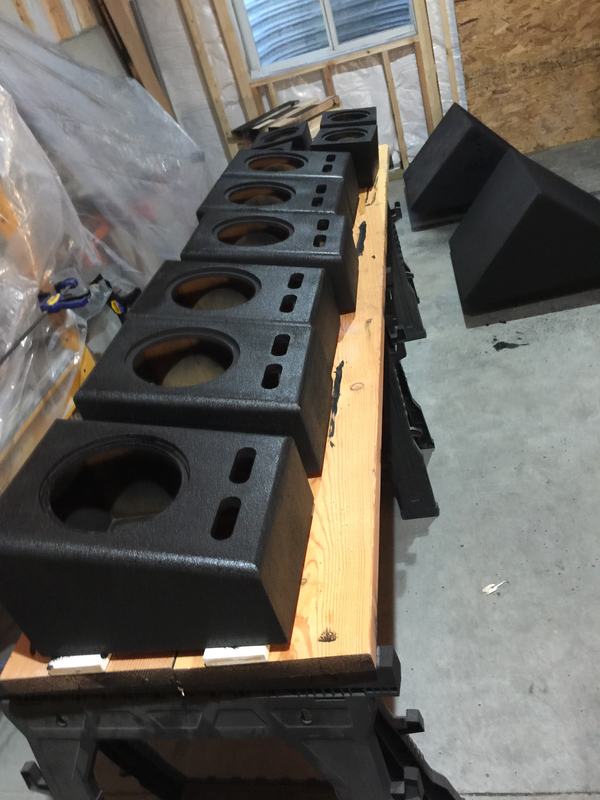 The front stage will have 4 SI HT18D2s in DIYSG 4cf sealed enclosures stacked. 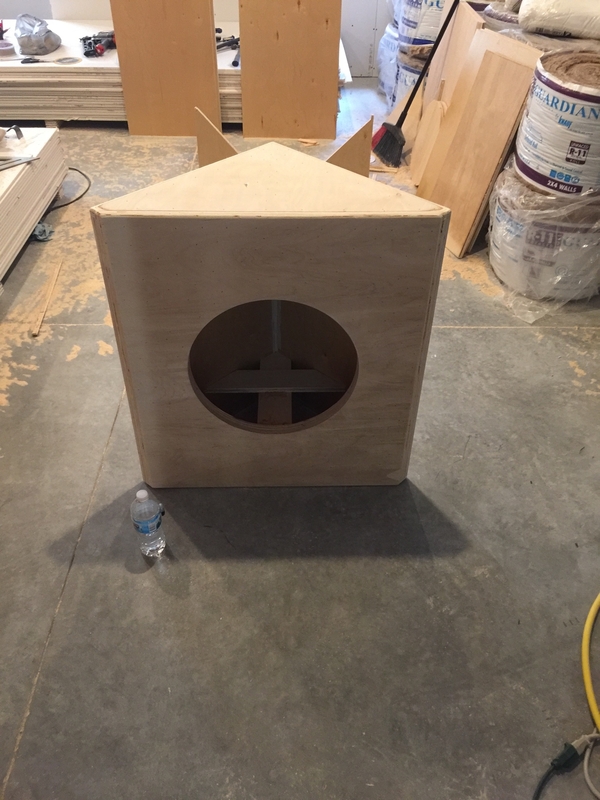 The rear subs will be in the back corners of the theater in custom built 4cf (after driver and bracing) corner cabinets housing 2 more SI HT18D2s. The enclosures will be hidden behind fabric covered panels. I will finish them in black but I am not worried about them being perfect. I see a LOT of sheetrock. Can we get a glimpse at the rest of the space? Lol. That's only half of what's left. The rest of the 5/8" sheets are still in the garage. Theater is getting 2 layers of 5/8" while the outside wall between the bar and theater is getting 2 layers of 1/2". I will see about getting some pics today but it is currently very messy down there. It's not messy, its organized chaos. Why not stick with a single layer of 5/8 on the bar wall? I'm not really UP on my STC ratings but i wonder what the difference between 2 layers of 1/2" and 1 layer of 5/8 would be? If you soundbatt the cavity, i think the extra 1/2" is moot. You're looking at a rating of somewhere in the 60-65 area which means you could be listening to 100db in your HT and only 30db would escape....That's going to be preeeeeetty quiet. 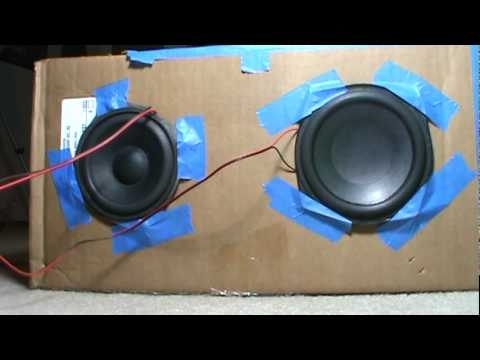 I will have a total of 6 18 subs running off of a possible 14,000 watts of class D amplification. 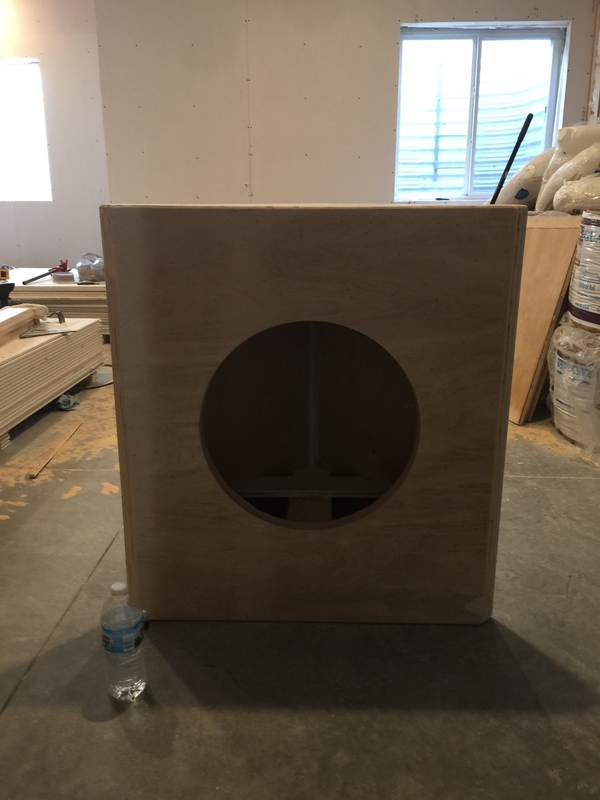 The rear wall is a staggered 6" bar side stud, 3.5" theater side stud clip isolated wall. There is R19 batts on the bar side, R11 on the theater side with a ~2.5" air gap between. My goal is an STC in the neighborhood of 70-73. And my wife was adamant about the bar and theater not interfering with each other's enjoyment. Wow....i know whose basement i'm going to when i want to start hacking people apart. I thought my quick math was pretty close but i might be missing something. Are you doing one wall or two? Are you fully installing acoustic panels to cover the 100% of the walls? Sorry for the questions. I just want to have something to fall back on when the time comes for me to build a better HT room. Sorry for the questions. I just want to have something to fall back on when the time comes for me to build a better NURSERY room. And she'll beat mine and Ryans beehind for building it wrong. She's got knife skillz too. No more children my friend.....at least not that have my genes. Remember, you and i share a common bond with being in the "Two Daughters Club" or as i like to call it...F^&*3d. 2 walls are adjacent to outer concrete walls. The other 2 walls are essentially 3 walls thick with staggered studs and double drywall on both outer faces. Green glue between layers in the theater, both walls and ceilings. The subfloor above the theater is getting 2 layers of drywall with green glue between both subfloor and drywall and then both layers of drywall in each joist bay. R19 in the ceiling. Room treatments will be a best of scenario once the "bunker" is finished and I can measure the response of the room. But a combo of absorption and diffusion. Doors will be a pair of solid core communicating doors with weather strip and mechanical thresholds. 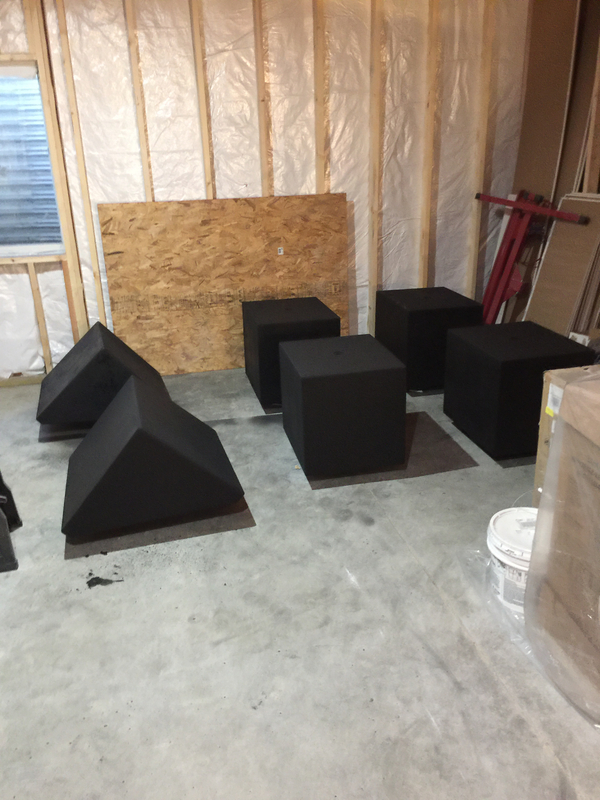 The risers and stage will be configured as bass traps. With both rows of seating being suspended and only the "pit" between the first riser and the stage being on top of the concrete (although, I will most likely do dricore for that. We do separated demising walls in our buildings as well. One big difference is in between the 2 studded walls, we have a layer of plywood but that is primarily for "shear" forces on the building. You can't hear anything when complete. Sounds like fun. Pun INTENDED! The only two changes i would have made would be to add resilient channel to the ceiling to decouple the drywall from your floor joists for noise/bass transmission, AND don't buy into drywall glue, on your next go around of course. Resilient channel is in the house, Fredrique. Fancy little de-couple system. Looks like neoprene isolation boots to hold the track in place away from the bottom of the TGI joists. Clips and channel is on the menu for the ceiling. I am doing it a bit differently so as to not give up the head room...clips recessed so that the drywall is ~1/2" below the original joists. Doing a layer of plywood inside the walls...or any "sealed" mass really would cause a triple leaf effect. Holy Cow. Hope you have a good dental plan and chiropractor because that room should jar everything loose and in the wrong direction. How big is the room? Pictures...don't make me ask a 45th time. Lightman, I'm holding up a finger for you and no, it's not NOT my middle finger. Sorry for the delay on pics. Working this evening so I have been focused on that. Looks like a sweet build! I don't have an air hole or I would! I hope that's an Amsoil box. 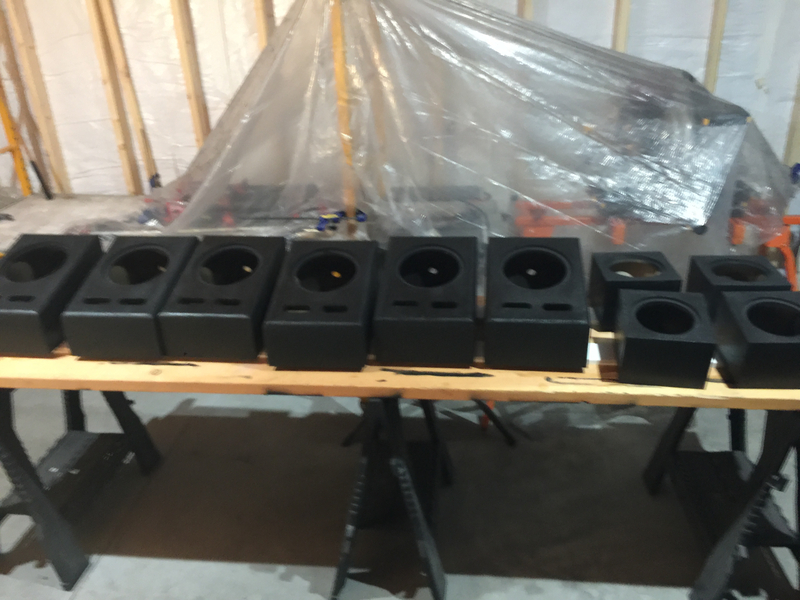 Spent the last week prepping and painting all 6 sub enclosures, 6 DIYSG Volt 8LXs in slanted ported enclosures and 4 Volt 6LXs in sealed Atmos enclosures. ^^^ That looks like some enemy alien army building up to attack Earth. Understand why you needed a fancy night out on the town! Worst paint job I've seen. Not a kitty anywhere to say hello to! I just want it done!! !